Time To Service Your Brakes? Accelerating and braking are the two primary functions of your vehicle. You cannot get down the road if the gas pedal isn’t fully functional. And, alternatively, you can get down the road or across the parking lot much too quickly if the brake pedal isn’t cooperating. This is not a risk that any of us can be willing to take. That is why brake problems must be taken very seriously at the first indication that something is wrong. Do you hear a noise when you start to brake? Have passengers or other drivers mentioned any noises associated with your brakes that you might not be hearing? Do you feel your brakes grinding, vibrating or pulsating when you press down on the brake pedal? 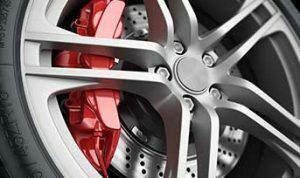 If any of these issues describe what you are hearing or feeling in regard to your vehicle, then it’s time to get have your brakes looked at by a professional. Although most of us have that handy neighbor or buddy across town that know a thing or two about cars, it’s nice to rest peacefully at night knowing that your brakes are in the hands of someone who knows what they are doing when they take a long look at your vehicle. Faulty brakes are not anything that we can manage to disregard without endangering ourselves, our passengers, or any other driver that we meet out on the road. That is why you need someone who you can trust when it’s time to give your vehicle a thorough checkup. You need to regain the confidence of smooth braking, and you need someone with a wealth of experience who is up to the task. At Anything Automotive Performance, we know a lot about all of the odd sounds, vibrations and even smells that come with necessary brake repair. It usually only takes a few quick examination tactics for us to determine the problem, and then we can get started in the process of fixing it. We are proud to offer superior brake services and repair to customers all across the Dallas-Fort Worth area and beyond. Our work is reliable and affordable, and we know that both of those factors are very important when customers are shopping around for the right auto shop. We have a lot of experience in working with vehicles of all types, and we have learned a great deal about various brake systems. You can depend on us to give you a fair and accurate assessment of your brake problems and then make proper repairs accordingly, always walking you through the process. Give us a call today to learn more about our services and how to become our next satisfied customer!